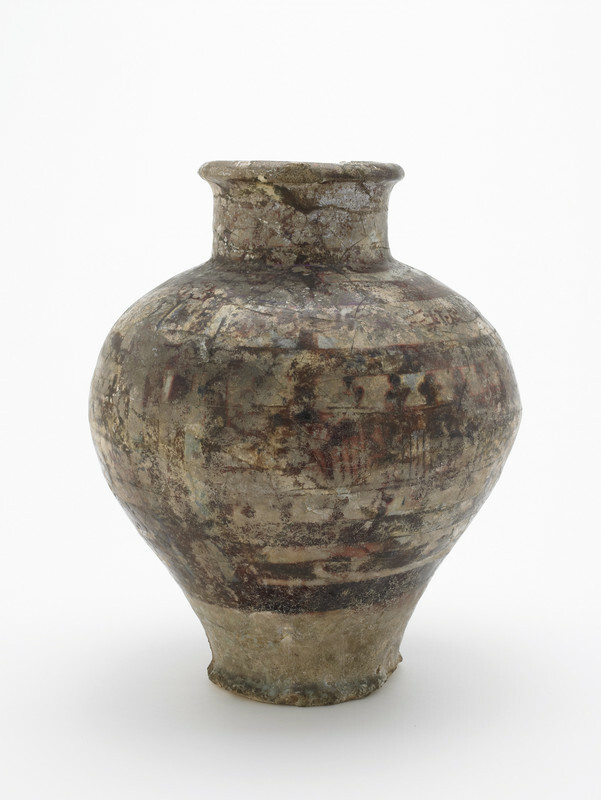 The glaze and decoration on this Raqqa ware jar now dated to the twelfth or thirteenth century, is extremely discolored and the surface partially disintegrated. Its abraded greenish glaze, overpainted with luster in shades of brown and cobalt blue, were, however, the vessel's chief attraction for Freer. He described the jar "valuable" and "fine in color." In 1903, when he purchased this vessel from the Paris-based dealer Dikran Kelekian, Freer had only recently turned his attention to ancient and medieval glazed wares from the Near East. As the availability of Japanese art in Western markets began to decline, Kelekian, Siegfried Bing and other dealers looked to the arts of the Islamic world, where recent unofficial excavations had made ceramics and textiles available. "Jar," in The Peacock Room, Freer Gallery of Art, Smithsonian Institution, Accession No. F1903.189, Item #3130, http://www.peacockroom.wayne.edu/items/show/3130 (accessed April 19, 2019).